1 Let God arise, let His enemies be scattered, And let them who hate Him flee before Him. 2 As smoke is whirled, whirl [them] away: As wax melts before fire, May the wicked perish before God! 3 But may the righteous rejoice [and] exult before God, And be mirthful in joy. 6 God, who makes the solitary to dwell in a home, Who brings out the prisoners into prosperity: Yet the rebellious inhabit a burnt-up land. 7 O God, at Thy going forth before Thy people, At Thy marching through the wilderness; Selah. 8 The earth quaked, the heavens also dropped before God Yonder Sinai [quaked] before God, the God of Israel. 9 With a gracious rain, O God, Thou didst besprinkle Thine inheritance; And [when it was] faint, Thou didst refresh it. 10 Thine assembly dwelt herein: Thou didst prepare in Thy goodness for the poor, O God. 11 The Lord gives the word: The women telling the good tidings are a great army. 12 Kings of armies flee, they flee: And the home-keeping [woman] divides the spoil. 14 When the Almighty scattered kings in it, It snowed in Salmon. 15 A mountain of God is the mountain of Bashan, A many-peaked mountain is the mountain of Bashan. 16 Why look ye with envy, O many-peaked mountains, On the mountain which God has desired to dwell in? Yea, God will abide in it for ever. 17 The chariots of God are myriads and myriads, thousands on thousands: God is among them; Sinai is in the sanctuary. 18 Thou hast ascended on high, Thou hast led captive a band of captives, Thou hast taken gifts among men, Yea, even the rebellious shall dwell with Jah, God. 19 Blessed be the Lord! Day by day He bears our burdens, Even the God [who is] our salvation. 20 God is to us a God of deliverances, And Jehovah the Lord has escape from death. 21 Yea, God will crush the head of His enemies, The hairy skull of him that goes on in his guiltiness. 23 That thou mayest bathe thy foot in blood, That the tongue of thy dogs may have its portion from the enemy. 24 They have seen Thy goings, O God, The goings of my God, my King, into the sanctuary. 25 Before go singers, after [come] those who strike the strings, In the midst of maidens beating timbrels. 26 "In the congregations bless ye God, The Lord, [ye who spring] from the fountain of Israel." 27 There was little Benjamin their ruler, (?) The princes of Judah, their shouting multitude, The princes of Zebulun, the princes of Naphtali. 28 Command, O God, Thy strength, Show Thyself strong, O God, Thou that hast wrought for us. 29 From Thy temple above Jerusalem Unto Thee shall kings bring presents. 30 Rebuke the beast of the reeds, The herd of bulls, with the calves of the peoples; Tread down those that have pleasure in silver; (?) Scatter the peoples that delight in wars. 31 Great ones shall come from Egypt, Cush shall quickly stretch out her hands to God. 32 Ye kingdoms of the earth, sing to God; Harp [unto] the Lord; Selah. 33 To Him who rides on the heavens of heavens, [which are] of old; Lo, He utters His voice, a voice of strength. 34 Ascribe to God strength, Whose majesty is over Israel, and His strength in the clouds. 35 Dread [art Thou], O God, from Thy sanctuaries, The God of Israel, He gives strength and fulness of might to His people. Blessed be God! This superb hymn is unsurpassed, if not unequalled, in grandeur, lyric fire, and sustained rush of triumphant praise. It celebrates a victory; but it is the victory of the God who enters as a conqueror into His sanctuary. To that entrance (vv. 15-18) all the preceding part of the psalm leads up; and from it all the subsequent part flows down. The Exodus is recalled as the progress of a king at the head of his hosts, and old pæans re-echo. That dwelling of God in the sanctuary is "for ever." Therefore in the second part of the psalm (vv. 19-35) its consequences for the psalmist's generation and for the future are developed--Israel's deliverance, the conquest of the nations, and finally the universal recognition of God's sovereignty and ringing songs sent up to Him. The Davidic authorship is set aside as impossible by most recent commentators, and there is much in the psalm which goes against it; but, on the other hand, the Syro-Ammonite war (2 Sam. xi. ), in which the ark was taken into the field, is not unnaturally supposed by Delitzsch and others to explain the special reference to the entrance of God into the sanctuary. The numerous quotations and allusions are urged as evidence of late date, especially the undeniable resemblance with Isaiah II. But the difficulty of settling which of two similar passages is original and which copy is great; and if by one critical canon such allusions are marks of lateness, by another, rugged obscurities, such as those with which this psalm bristles, are evidences of an early date. The mention of only four tribes in ver. 27 is claimed as showing that the psalm was written when Judæa and Galilee were the only orthodox districts, and central Palestine was in the hands of the Samaritans. But could there be any talk of "princes of Zebulun and Naphtali" then? The exultant tone of the psalm makes its ascription to such a date as the age of the Ptolemies unlikely, when "Israel is too feeble, too depressed, to dream of self-defence; and, if God does not soon interpose, will be torn to pieces" (Cheyne, "Aids to the Devout Study," etc., 335). To the present writer it does not appear that the understanding and enjoyment of this grand psalm depend so much on success in dating it as is supposed. It may be post-exilic. Whoever fused its reminiscences of ancient triumph into such a glowing outburst of exultant faith, his vision of the throned God and his conviction that ancient facts reveal eternal truths remain for all generations as an encouragement of trust and a prophecy of God's universal dominion. The main division at ver. 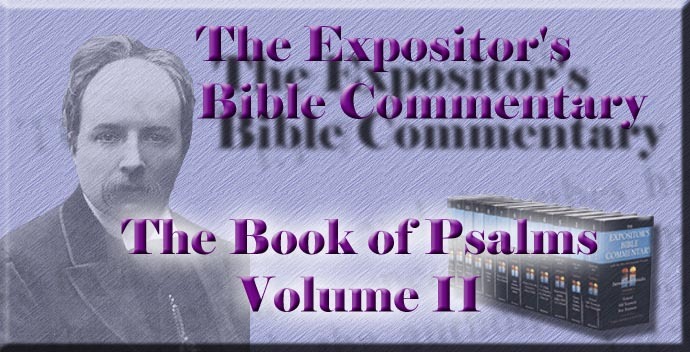 18 parts the psalm into two equal halves, which are again easily subdivided into strophes. The first strophe (vv. 1-6) may be regarded as introductory to the chief theme of the first half--namely, the triumphant march of the conquering God to His sanctuary. It consists of invocation to Him to arise, and of summons to His people to prepare His way and to meet Him with ringing gladness. The ground of both invocation and summons is laid in an expansion of the meaning of His name as Helper of the helpless, Deliverer of the captive, righteous, and plentifully rewarding the proud doer. The invocation echoes the Mosaic prayer "when the ark set forward" (Numb. x. 35), with the alteration of the tense of the verb from a simple imperative into a precative future, and of "Jehovah" into God. This is the first of the quotations characteristic of the psalm, which is penetrated throughout with the idea that the deeds of the past are revelations of permanent relations and activities. The ancient history glows with present life. Whatever God has done He is doing still. No age of the Church needs to look back wistfully to any former, and say, "Where be all His wondrous works which our fathers have told us of?" The twofold conditions of God's intervention are, as this strophe teaches, Israel's cry to Him to arise, and expectant diligence in preparing His way. The invocation, which is half of Israel's means of insuring His coming, being a quotation, the summons to perform the other half is naturally regarded by the defenders of the post-exilic authorship as borrowed from Isaiah II. (e.g. , xl. 3, lvii. 14, lxii. 10), while the supporters of an earlier date regard the psalm as the primary passage from which the prophet has drawn. God "arises" when He displays by some signal act His care for His people. That strong anthropomorphism sets forth the plain truth that there come crises in history, when causes, long silently working, suddenly produce their world-shaking effects. God has seemed to sit passive; but the heavens open, and all but blind eyes can see Him, standing ready to smite that He may deliver. When He rises to His feet; the enemy scatters in panic. His presence revealed is enough. The emphatic repetition of "before" in these verses is striking, especially when fully rendered,--from His face (ver. 1); from the face of the fire (ver. 2); from the face of God (ver. 2); before His face (vv. 3, 4). To His foes that face is dreadful, and they would fain cower away from its light; His friends sun themselves in its brightness. The same fire consumes and vivifies. All depends on the character of the recipients. In the psalm "the righteous" are Israel, the ideal nation; the "wicked" are its heathen foes; but the principle underlying the fervid words demands a real assimilation of moral character to the Divine, as a condition of being at ease in the Light. The "deserts" are, in consonance with the immediately following reminiscences, those of the Exodus. Hupfeld and those who discover in the psalm the hopes of the captives in Babylon, take them to be the waste wilderness stretching between Babylon and Palestine. But it is better to see in them simply a type drawn from the past, of guidance through any needs or miseries. Vv. 5, 6, draw out at length the blessed significance of the name Jah, in order to hearten to earnest desire and expectance of Him. They are best taken as in apposition with "Him" in ver. 4. Well may we exult before Him who is the orphans' father, the widows' advocate. There may be significance in the contrast between what He is "in His holy habitation" and when He arises to ride through the deserts. Even in the times when he seems to be far above, dwelling in the separation of His unapproachable holiness, He is still caring and acting for the sad and helpless. But when He comes forth, it is to make the solitary to dwell in a home, to bring out prisoners into prosperity. Are these simply expressions for God's general care of the afflicted, like the former clauses, or do they point back to the Exodus? A very slight change in the text gives the reading, "Makes the solitary to return home"; but even without that alteration, the last clause of the verse is so obviously an allusion to the disobedient, "whose carcasses fell in the wilderness," that the whole verse is best regarded as pointing back to that time. The "home" to which the people were led is the same as the "prosperity" into which the prisoners are brought--namely, the rest and well-being of Canaan; while the fate of the "rebellious" is, as it ever is, to live and die amidst the drought-stricken barrenness which they have chosen. With the second strophe (vv. 7-10) begins the historical retrospect, which is continued till, at the end of the fourth (ver. 18), God is enthroned in the sanctuary, there to dwell for ever. In the second strophe the wilderness life is described. The third (vv. 11-14) tells of the victories which won the land. The fourth triumphantly contrasts the glory of the mountain where God at last has come to dwell, with the loftier peaks across the Jordan on which no such lustre gleams. Vv. 7, 8, are from Deborah's song, with slight omissions and alterations, notably of "Jehovah" into "God." The phrase "before" still rings in the psalmist's ears, and he changes Deborah's words, in the first clause of ver. 7, so as to give the picture of God marching in front of His people, instead of, as the older song represented Him, coming from the east, to meet them marching from the west. The majestic theophany at the giving of the Law is taken as the culmination of His manifestations in the wilderness. Vv. 9, 10, are capable of two applications. According to one, they anticipate the chronological order, and refer to the fertility of the land, and the abundance enjoyed by Israel when established there. According to the other, they refer to the sustenance of the people in the wilderness. The former view has in its favour the ordinary use of "inheritance" for the land, the likelihood that "rain" should be represented as falling on soil rather than on people, and the apparent reference in "dwelt therein," to the settlement in Canaan. The objection to it is that reference to peaceful dwelling in the land is out of place, since the next strophe pictures the conquest. If, then, the verses belong to the age of wandering, to what do they refer? Hupfeld tries to explain the "rain" as meaning the manna, and, still more improbably, takes the somewhat enigmatical "assembly" of ver. 10 to mean (as it certainly does) "living creatures," and to allude (as it surely does not) to the quails that fell round the camp. Most commentators now agree in transferring "thine inheritance" to the first clause, and in understanding it of the people, not of the land. The verse is intelligible either as referring to gifts of refreshment of spirit and courage bestowed on the people, in which case "rain" is symbolical; or to actual rainfall during the forty years of desert life, by which sowing and reaping were made possible. The division of the verse as in our translation is now generally adopted. The allusion to the provision of corn in the desert is continued in ver. 10, in which the chief difficulty is the ambiguous word "assembly." It may mean "living creatures," and is so taken here by the LXX. and others. It is twice used in 2 Sam. xxii. 11 (? ), 13, for an army. Delitzsch takes it as a comparison of Israel to a flock, thus retaining the meaning of creatures. If the verse is interpreted as alluding to Israel's wilderness life, "therein" must be taken in a somewhat irregular construction, since there is no feminine noun at hand to which the feminine pronominal suffix in the word can be referred. In that barren desert, God's flock dwelt for more than a generation, and during all that time His goodness provided for them. The strophe thus gives two aspects of God's manifestation in the wilderness--the majestic and terrible, and the gentle and beneficent. In the psalmist's triumphant retrospect no allusion is made to the dark obverse--Israel's long ingratitude. The same history which supplies other psalmists and prophets with material for penetrating accusations yields to this one only occasion of praise. God's part is pure goodness; man's is shaded with much rebellious murmuring. The next strophe (vv. 11-14) is abrupt and disconnected, as if echoing the hurry of battle and the tumult of many voices on the field. The general drift is unmistakable, but the meaning of part is the despair of commentators. The whole scene of the conflict, flight, and division of the spoil is flashed before us in brief clauses, panting with excitement and blazing with the glow of victory. "The Lord giveth the word." That "word" may be the news which the women immediately repeat. But it is far more vivid and truer to the spirit of the psalm, which sees God as the only actor in Israel's history, to regard it as the self-fulfilling decree which scatters the enemy. This battle is the Lord's. There is no description of conflict. But one mighty word is hurled from heaven, like a thunder-clap (the phrase resembles that employed so often, "the Lord gave His voice," which frequently means thunder-peals), and the enemies' ranks are broken in panic. Israel does not need to fight. God speaks, and the next sound we hear is the clash of timbrels and the clear notes of the maidens chanting victory. This picture of a battle, with the battle left out, tells best Who fought, and how He fought it. "He spake, and it was done." What scornful picture of the flight is given by the reduplication "they flee, they flee"! It is like Deborah's fierce gloating over the dead Sisera: "He bowed, he fell, he lay: at her feet he bowed, he fell: where he bowed, there he fell." What confidence in the power of weakness, when God is on its side, in the antithesis between the mighty kings scattered in a general sauve qui peut, and the matrons who had "tarried at home" and now divide the spoil! Sisera's mother was pictured in Deborah's song as looking long through her lattice for her son's return, and solacing herself with the thought that he delayed to part the plunder and would come back laden with it. What she vainly hoped for Israel's matrons enjoy. Vv. 13, 14, are among the hardest in the Psalter. The separate clauses offer no great difficulties, but the connection is enigmatical indeed. "Will (lit. if) ye lie among the sheepfolds?" comes from Deborah's song (Judg. v. 16), and is there a reproach flung at Reuben for preferring pastoral ease to warlike effort. Is it meant as reproach here? It is very unlikely that a song of triumph like this should have for its only mention of Israel's warriors a taunt. The lovely picture of the dove with iridescent wings is as a picture perfect. But what does it mean here? Herder, whom Hupfeld follows, supposes that the whole verse is rebuke to recreants, who preferred lying stretched at ease among their flocks, and bidding each other admire the glancing plumage of the doves that flitted round them. But this is surely violent, and smacks of modern æstheticism. Others suppose that the first clause is a summons to be up and pursue the flying foe, and the second and third a description of the splendour with which the conquerors (or their households) should be clothed by the spoil. This meaning would require the insertion of some such phrase as "ye shall be" before the second clause. Delitzsch regards the whole as a connected description of the blessings of peace following on victory, and sees a reference to Israel as God's dove. "The new condition of prosperity is compared with the play of colours of a dove basking in the rays of the sun." All these interpretations assume that Israel is addressed in the first clause. But is this assumption warranted? Is it not more natural to refer the "ye" to the "kings" just mentioned, especially as the psalmist recurs to them in the next verse? The question will then retain the taunting force which it has in Deborah's song, while it pictures a very different kind of couching among the sheepfolds--namely, the hiding there from pursuit. The kings are first seen in full flight. Then the triumphant psalmist flings after them the taunt, "Will ye hide among the cattle?" If the initial particle retains its literal force, the first clause is hypothetical, and the suppression of the conclusion speaks more eloquently than its expression would have done: "If ye couch----" The second and third clauses are then parallel with the second of ver. 12, and carry on the description of the home-keeping matron, "the dove," adorned with rich spoils and glorious in her apparel. We thus have a complete parallelism between the two verses, which both lay side by side the contrasted pictures of the defeated kings and the women; and we further establish continuity between the three verses (13-15), in so far as the "kings" are dealt with in them all. Ver. 14 is even harder than the preceding. What does "in it" refer to? Is the second clause metaphor, requiring to be eked out with "It is like as when"? If figure, what does it mean? One is inclined to say with Baethgen, at the end of his comment on the words, "After all this, I can only confess that I do not understand the verse." Salmon was an inconsiderable hill in Central Palestine, deriving its name (Shady), as is probable, from forests on its sides. Many commentators look to that characteristic for explanation of the riddle. Snow on the dark hill would show very white. So after the defeat the bleached bones of the slain, or, as others, their glittering armour, would cover the land. Others take the point of comparison to be the change from trouble to joy which follows the foe's defeat, and is likened to the change of the dark hillside to a gleaming snow-field. Hupfeld still follows Herder in connecting the verse with the reproach which he finds in the former one, and seeing in the words "It snowed on Salmon" the ground of the recreants' disinclination to leave the sheepfolds--namely, that it was bad weather, and that, if snow lay on Salmon in the south, it would be worse in the north, where the campaign was going on! He acknowledges that this explanation requires "a good deal of acuteness to discover," and says that the only alternative to accepting it, provisionally, at all events, is to give up the hope of any solution. Cheyne follows Bickell in supposing that part of the text has dropped out, and proposes an additional clause at the beginning of the verse and an expansion of the last clause, arriving at this result: "[For full is our land of spoil], When Shaddai scatters kings therein, [As the snow,] when it snows in Salmon." The adoption of these additions is not necessary to reach this meaning of the whole, which appears the most consonant with the preceding verses, as continuing the double reference which runs through them--namely, to the fugitive kings and the dividers of the spoil. On the one side we see the kings driven from their lurking-places among the sheepfolds; on the other, the gleam of rich booty, compared now to the shining white wrapping the dark hill, as formerly to the colours that shimmer on sunlit pinions of peaceful doves. If this is not the meaning, we can only fall back on the confession already quoted. The battle is over, and now the Conqueror enters His palace-temple. The third strophe soars with its theme, describing His triumphal entry thither and permanent abiding there. The long years between the conquest of Canaan and the establishment of the ark on Zion dwindle to a span; for God's enthronement there was in one view the purpose of the conquest, which was incomplete till that was effected. There is no need to suppose any reference in the mention of Bashan to the victories over Og, its ancient king. The noble figure needs no historic allusion to explain it. These towering heights beyond Jordan had once in many places been seats of idol worship. They are emblems of the world's power. No light rests upon them, lofty though they are, like that which glorifies the insignificant top of Zion. They may well look enviously across the Jordan to the hill which God has desired for His abode. His triumphal procession is not composed of earthly warriors, for none such had appeared in the battle. He had conquered, not by employing human hands, but by His own "bright-harnessed angels." They now surround Him in numbers innumerable, which language strains its power in endeavouring to reckon. "Myriads doubled, thousands of repetition," says the psalmist--indefinite expressions for a countless host. But all their wide-flowing ranks are clustered round the Conqueror, whose presence makes their multitude an unity, even as it gives their immortal frames their life and strength, and their faces all their lustrous beauty. "God is in the midst of them"; therefore they conquer and exult. "Sinai is in the sanctuary." This bold utterance has led to a suggested emendation, which has the advantage of bringing out clearly a quotation from Deut. xxxiii. 2. It combines the second and third clauses of ver. 17, and renders "The Lord hath come from Sinai into the sanctuary." But the existing text gives a noble thought--that now, by the entrance of God thither, Sinai itself is in the sanctuary, and all the ancient sanctities and splendours, which flamed round its splintered peaks, are housed to shine lambent from that humble hill. Sinai was nothing but for God's presence. Zion has that presence; and all that it ever meant it means still. The profound sense of the permanent nature of past revelation, which speaks all through the psalm, reaches its climax here. The "height" to which ver. 18 triumphantly proclaims that God has gone up, can only be Zion. To take it as meaning the heavenly sanctuary, as in Psalm vii. 7 it unquestionably does, is forbidden by the preceding verses. Thither the conquering God has ascended, as to His palace, leading a long procession of bound captives, and there receiving tribute from the vanquished. Assyrian slabs and Egyptian paintings illustrate these representations. The last clause has been variously construed and understood. Is "Yea, even the rebellious" to be connected with the preceding, and "among" to be supplied, so that those once rebellious are conceived of as tributary, or does the phrase begin an independent clause? The latter construction makes the remainder of the verse run more intelligibly, and obviates the need for supplying a preposition with "the rebellious." It still remains a question whether the last words of the clause refer to God's dwelling among the submissive rebels, or to their dwelling with God. If, however, it is kept in view that the context speaks of God as dwelling in His sanctuary, the latter is the more natural explanation, especially as a forcible contrast is thereby presented to the fate of the "rebellious" in ver. 6. They dwell in a burnt-up land; but, if they fling away their enmity, may be guests of God in His sanctuary. Thus the first half of the psalm closes with grand prophetic hopes that, when God has established His abode on Zion, distant nations shall bring their tribute, rebels return to allegiance, and men be dwellers with God in His house. In such anticipations the psalm is Messianic, inasmuch as these are only fulfilled in the dominion of Jesus. Paul's quotation of this verse in Eph. iv. 8 does not require us to maintain its directly prophetic character. Rather, the apostle, as Calvin says, "deflects" it to Christ. That ascent of the ark to Zion was a type rather than a prophecy. Conflict, conquest, triumphant ascent to a lofty home, tribute, widespread submission, and access for rebels to the royal presence--all these, which the psalmist saw as facts or hopes in their earthly form, are repeated in loftier fashion in Christ, or are only attainable through His universal reign. The apostle significantly alters "received among" into "gave to," sufficiently showing that he is not arguing from a verbal prophecy, but from a typical fact, and bringing out the two great truths, that, in the highest manifestation of the conquering God, the conquered receive gifts from the victor, and that the gifts which the ascended Christ bestows are really the trophies of His battle, in which He bound the strong man and spoiled his house. The attempt to make out that the Hebrew word has the extraordinary doubled-barrelled meaning of receiving in order to give is futile, and obscures the intentional freedom with which the apostle deals with the text. The Ascension is, in the fullest sense, the enthronement of God; and its results are the growing submission of nations and the happy dwelling of even the rebellious in His house. The rapturous emphasis with which this psalm celebrates God's entrance into His sanctuary is most appropriate to Davidic times. The psalm reaches its climax in God's enthronement on Zion. Its subsequent strophes set forth the results thereof. The first of these, the fifth of the psalm (vv. 19-23), suddenly drops from strains of exultation to a plaintive note, and then again as suddenly breaks out into stern rejoicing over the ruin of the foe. There is wonderful depth of insight and tenderness in laying side by side the two thoughts of God, that He sits on high as conqueror, and that He daily bears our burdens, or perhaps bears us as a shepherd might his lambs. Truly a Divine use for Divine might! To such lowly offices of continual individualising care will the Master of many legions stoop, reaching out from amid their innumerable myriads to sustain a poor weak man stumbling under a load too great for him. Israel had been delivered by a high hand, but still was burdened. The psalmist has been recalling the deeds of old, and he finds in them grounds for calm assurance as to the present. To-day, he thinks, is as full of God as any yesterday, and our "burdens" as certain to be borne by Him, as were those of the generation that saw His Sinai tremble at His presence. To us, as to them, He is "a God of deliverances," and for us can provide ways of escape from death. The words breathe a somewhat plaintive sense of need, such as shades our brightest moments, if we bethink ourselves; but they do not oblige us to suppose that the psalm is the product of a time of oppression and dejection. That theory is contradicted by the bounding gladness of the former part, no less than by the confident anticipations of the second half. But no song sung by mortal lips is true to the singer's condition, if it lacks the minor key into which this hymn of triumph is here modulated for a moment. It is but for a moment, and what follows is startlingly different. Israel's escape from death is secured by the destruction of the enemy, and in it the psalmist has joy. He pictures the hand that sustained him and his fellows so tenderly, shattering the heads of the rebellious. These are described as long-haired, an emblem of strength and insolence which one is almost tempted to connect with Absalom; and the same idea of determined and flaunting sin is conveyed by the expression "goes on in his guiltinesses." There will be such rebels, even though the house of God is open for them to dwell in, and there can be but one end for such. If they do not submit, they will be crushed. The psalmist is as sure of that as of God's gentleness; and his two clauses do state the alternative that every man has to face--either to let God bear his burden or to be smitten by Him. Vv. 22, 23, give a terrible picture of the end of the rebels. The psalmist hears the voice of the Lord promising to bring some unnamed fugitives from Bashan and the depths of the sea in order that they may be slain, and that he (or Israel) may bathe his foot in their blood, and his dogs may lick it, as they did Ahab's. Who are to be brought back? Some have thought that the promise referred to Israel, but it is more natural to apply it to the flying foe. There is no reference to Bashan either as the kingdom of an ancient enemy or as envying Zion (ver. 15). But the high land of Bashan in the east and the depths of the sea to the west are taken (cf. Amos ix. 1-3) as representing the farthest and most inaccessible hiding-places. Wherever the enemies lurk, thence they will be dragged and slain. The existing text is probably to be amended by the change of one letter in the verb, so as to read "shall wash" or bathe, as in Psalm lviii. 10, and the last clause to be read, "That the tongue of thy dogs may have its portion from the enemy." The blood runs ankle-deep, and the dogs feast on the carcasses or lick it--a dreadful picture of slaughter and fierce triumph. It is not to be softened or spiritualised or explained away. There is, no doubt, a legitimate Christian joy in the fall of opposition to Christ's kingdom, and the purest benevolence has sometimes a right to be glad when hoary oppressions are swept away and their victims set free; but such rejoicing is not after the Christian law unless it is mingled with pity, of which the psalm has no trace. The next strophe (vv. 24-27) is by some regarded as resuming the description of the procession, which is supposed to have been interrupted by the preceding strophe. But the joyous march now to be described is altogether separate from the majestic progress of the conquering King in vv. 17, 18. This is the consequence of that. God has gone into His sanctuary. His people have seen His solemn entrance thither, and therefore they now go up to meet Him there with song and music. Their festal procession is the second result of His enthronement, of which the deliverance and triumph described in the preceding strophe were the first. The people escaped from death flock to thank their Deliverer. Such seems to be the connection of the whole, and especially of vv. 24, 25. Instead of myriads of angels surrounding the conquering God, here are singers and flute-players and damsels beating their timbrels, like Miriam and her choir. Their shrill call in ver. 26 summons all who "spring from the fountain of Israel"--i.e., from the eponymous patriarch--to bless God. After these musicians and singers, the psalmist sees tribe after tribe go up to the sanctuary, and points to each as it passes. His enumeration is not free from difficulties, both in regard to the epithets employed and the specification of the tribes. The meaning of the word rendered "ruler" is disputed. Its form is peculiar, and the meaning of the verb from which it is generally taken to come is rather to subdue or tread down than to rule. If the signification of ruler is accepted, a question rises as to the sense in which Benjamin is so called. Allusion to Saul's belonging to that tribe is thought of by some; but this seems improbable, whether the psalm is Davidic or later. Others think that the allusion is to the fact that, according to Joshua xviii. 16, the Temple was within Benjamite territory; but that is a far-fetched explanation. Others confine the "rule" to the procession, in which Benjamin marches at the head, and so may be called its leader; but ruling and leading are not the same. Others get a similar result by a very slight textual change, reading "in front" instead of "their ruler." Another difficulty is in the word rendered above "their shouting multitude," which can only be made to mean a company of people by a somewhat violent twist. Hupfeld (with whom Bickell and Cheyne agree) proposes an alteration which yields the former sense and is easy. It may be tentatively adopted. A more important question is the reason for the selection of the four tribes named. The mention of Benjamin and Judah is natural; but why are Zebulun and Naphtali the only representatives of the other tribes? The defenders of a late date answer, as has been already noticed, Because in the late period when the psalm was written, Galilee and Judæa "formed the two orthodox provinces." The objection to this is that in the post-exilic period there were no distinct tribes of Zebulun and Naphtali, and no princes to rule. The mention of these tribes as sharing in the procession to the sanctuary on Zion would have been impossible during the period of the northern kingdom. If, then, these two periods are excluded, what is left but the Davidic? The fact seems to be that we have here another glance at Deborah's song, in which the daring valour of these two tribes is set in contrast with the sluggish cowardice of Reuben and the other northern ones. Those who had done their part in the wars of the Lord now go up in triumph to His house. That is the reward of God's faithful soldiers. The next strophe (vv. 28-31) is the prayer of the procession. It falls into two parts of two verses each, of which the former verse is petition, and the latter confident anticipation of the results of answered prayer. The symmetry of the whole requires the substitution in ver. 28 of "command" for "hath commanded." God's strength is poetically regarded as distinct from Himself and almost personified, as "loving-kindness" is in Psalm xlii. 8. The prayer is substantially equivalent to the following petition in ver. 28 b. Note how "strength" occurs four times in vv. 33-35. The prayer for its present manifestation is, in accordance with the historical retrospect of the first part, based upon God's past acts. It has been proposed to detach "From Thy Temple" from ver. 29, and to attach it to ver. 28. This gets over a difficulty, but unduly abbreviates ver. 29, and is not in harmony with the representation in the former part, which magnifies what God has wrought, not "from the Temple," but in His progress thither. No doubt the retention of the words in ver. 29 introduces a singular expression there. How can presents be brought to God "from Thy Temple"? The only explanation is that "Temple" is used in a restricted sense for the "holy place," as distinguished from the "holy of holies," in which the ark was contained. The tribute-bearers stand in that outer sanctuary, and thence present their tokens of fealty. The city is clustered round the Temple mount, and therefore the psalm says, "Thy Temple above Jerusalem." One is tempted to read "unto" instead of "from"; for this explanation can scarcely be called quite satisfactory. But it seems the best that has been suggested. The submission of kings of unnamed lands is contemplated as the result of God's manifestation of strength for Israel. Ver. 30 resumes the tone of petition, and maintains it throughout. "The beast of the reeds," probably the crocodile, is a poetic designation for Egypt, the reference to which is claimed by both the defenders of the Davidic and of the post-exilic date as in their favour. The former say that, in David's day, Egypt was the greatest world-power known to the Hebrews; and the latter, that the mention of it points to the time when Israel lay exposed to the attacks of Seleucidæ on the one hand and of Ptolemies on the other. Why, then, should only one of the two hostile neighbours be mentioned here? "Bulls" are a standing emblem of leaders of nations, and "calves" are accordingly their subjects. The two metaphors are naturally connected, and the correction "leaders of the peoples" is unnecessary, and a prosaic intermingling of figure and fact. Ver. 30 c is extremely obscure. Baethgen roundly says, "The meaning of the words can no longer be ascertained, and in all probability they are corrupt." The first word is a participle, which is variously taken as meaning "casting oneself to the ground" (i.e., in submission), and "trampling to the ground." It is also variously referred to the nations and their leaders spoken of in the previous verse, and to God. In the former case it would describe their attitude of submission in consequence of "rebuke"; in the latter, God's subjugation of them. The slightest change would make the word an imperative, thus bringing it into line with "rebuke"; but, even without this, the reference to God is apparently to be preferred. The structure of the strophe which, in the first verse of each pair, seems to put petitions and to confine its descriptions of the resulting subjugation of the enemy to the second verse in each case, favours the latter interpretation. The next words are also disputed. One rendering is, "with bars of silver"; another, "those that delight in silver." The former presupposes a very unusual word for "bars." It is necessarily adopted by those who refer the first word to the submission of the "herd of bulls." The enemies come with tribute of silver. The other rendering, which avoids the necessity of bringing in an otherwise unknown word, is necessarily preferred by the supporters of the second explanation of the preceding word. God is implored to crush "those who delight in silver," which may stand for a description of men of this world, but must be acknowledged to be rather a singular way of designating active enemies of God and Israel. Cheyne's rendering, "That rolls itself in mire for gain of money," brings in the mercenaries of the Seleucidæ. But "rolling oneself in mire" is a strange way of saying "hiring oneself out to fight." Certainty seems unattainable, and we must be content with the general trend of the verse as supplication for an exhibition of God's strength against proud opponents. The last clause sums up the whole in the petition, "Scatter the peoples that delight in wars." One verse then tells what the result of that will be. "Great ones" shall come from the land of the beast of the reeds, and Ethiopia shall make haste to stretch out tribute-bearing hands to God. The vision of a world subjugated and loving its subjugation is rising before the poet. That is the end of the ways of God with Israel. So deeply had this psalmist been led into comprehension of the Divine purpose; so clearly was he given to see the future, "and all the wonder that should be." Therefore he breaks forth, in the last strophe, into invocation to all the kingdoms of the earth to sing to God. He had sung of His majesty as of old Jehovah "rode through the deserts"; and that phrase described His intervention in the field of history on behalf of Israel. Now the singer calls for praise from all the earth to Him who rides in the "most ancient heavens"; and that expression sets forth His transcendent majesty and eternal, universal sway. The psalmist had hymned the victory won when "God gave the word." Now he bids earth listen as "He gives His voice, a voice of strength," which moves and controls all creatures and events. Therefore all nations are summoned to give strength to God, who gives all fulnesses of strength to His people. The psalm closes with the utterance of the thought which has animated it throughout--that God's deeds for and in Israel are the manifestation for the world of His power, and that these will one day lead all men to bless the God of Israel, who shines out in dread majesty from the sanctuary, which is henceforth His abode for evermore.